Being an active member of a couple of IT projects and regularly attending hours of daily scrum meetings today I am overwhelmed to share my thoughts about it. An integral part of the Scrum process is the Daily Scrum meeting which is a regular ritual practiced every morning. The team comes together on each working day about the same time to discuss the status of the project. The synonyms to the Daily Scrum meeting include “Daily Stand up”, “Daily Scrum”, and “Scrum Meeting” among others. The meeting is an informal gathering of all the team members coming together in a circle. The very objective of this meeting is to ensure better coordination among the team members working towards the end goal. 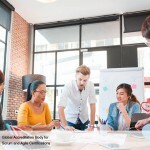 The Scrum meeting should not be confused with Status meeting, a meeting to provide status update to management or other stakeholders. Every team member’s active participation is appreciated along with a high degree of candidness. The milestone of having this meeting is to get a daily feedback on the progress of the project. The meeting is moderated by the Scrum Master. The sprint backlog is updated during the meeting. 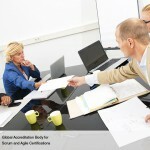 The challenge faced by the team members should be noted and resolved by the ScrumMaster. The technical discussion usually happens after the Scrum meeting and is attended by relevant technical members. Last minute hiccups at the end of the sprint can be avoided if there is a crystal clear update about the project during the daily standup. It is recommended that the product owner attends the daily standup. The daily stand up should happen even in the absence of the product owner or ScrumMaster. The meeting is timeboxed to a maximum time of 15 minutes and happens before the task board. Care must be taken to ensure each team member has sufficient time to answer the 3 questions which could last about 2-3 minutes. Any topic that needs further discussion is noted in the “virtual parking lot” which is discussed in detail after the standup. Why do we have standups and not sitdowns? If a person is standing still he is uncomfortable and if this standing person is speaking he is all the more at discomfort. It is this discomfort that cut short lengthy discussions. 3) What impediments my progress? The significance of this meeting is that it brings all the members of the team on a common platform. It instills discipline in the team. All the details pertaining to requirements and releases are obtained from the product owner. The daily standup helps in identifying and plugging the gaps in the teams commitment and understanding of requirements. 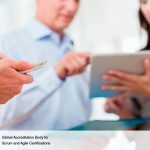 Hello,I read your blogs named “Significance of Daily Scrum Meeting | SCRUMstudy Blog” on a regular basis. Your humoristic style is bravo, keep up the good work!